Click the button below to add the Special Order Gift to your site survey. To custom make a gasket we need to know the outside edge dimensions of the gasket. For "Short Side", please measure the shorter of the two sides and enter the dimension into the drop downs. The whole number goes into the first drop down and the fraction goes into the second drop down. For "Long Side", please measure the longer of the two sides and enter the dimension into the drop downs. The whole number goes into the first drop down and the fraction goes into the second drop down. Make sure you're measuring outside edge dimensions of the gasket, from outside corner to outside corner. 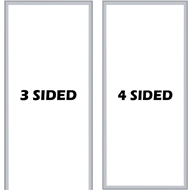 Refrigeration door gaskets are typically 4 sided - meaning they go around all four sides of the door. Gaskets can be 3 sided but this is most common on walk in cooler/freezer doors. Walk in doors sometimes have a door sweep on the bottom and this replaces the bottom side of the gasket.